Morgan Stoddart admits his chances of making a rapid return to the Wales squad on his comeback from a broken leg are "pretty slim". Stoddart, 27, was weeks away from 2011 World Cup selection when injury struck in a pre-tournament warm-up defeat by England at Twickenham. Cardiff Blue Leigh Halfpenny has since shone at 15 for Wales, while Scarlet Liam Williams has also impressed. "I've got to get back in the Scarlets' team first," said Stoddart. His first chance to do so could come against Newport Gwent Dragons in the Pro12 on Friday. The hosts hope to bounce back from successive defeats by the Ospreys and Treviso following wins against Leinster, Glasgow and Connacht that kicked off their season. A good performance against their Welsh rivals could give Stoddart a selection boost ahead of their Heineken Cup opener at Clermont Auvergne on Saturday, 13 October. Liam Williams apart, the eight-cap full-back also faces Scarlets competition from Jordan Williams, the 19-year-old who has also made his mark for the Scarlets this season. At Test level Clermont's Lee Byrne remains a full-back contender for the November and December games against Argentina, Samoa, New Zealand and Australia while Perpignan's James Hook has also played there for Wales. Once-capped Liam Williams took his chance to shine in 2011-12 during Stoddart's Scarlets absence. 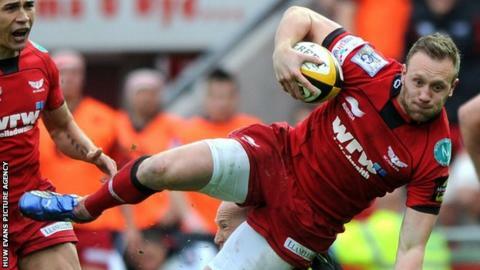 Stoddart said: "It seems like everyone who's played in the back three for the Scarlets, especially, has played well. "They're all scoring tries and all playing well so it's going to be tough to get back in the team. "That's what happens. Probably, if I didn't get injured, he [Williams] wouldn't have come through. "That's what happens when you get injured. "People get other chances and no doubt he's taken his chances very well. "It's nice to be coming to the end of the injury and being able to train fully and get back involved with all the boys playing." But Stoddart says he has returned faster than ever. "Surprisingly, actually, it's the fastest time I've recorded since the Scarlets began recording in 2008. "So that's pretty pleasing," he said.